Queens and nucs are available in very limited quantities through June; please call or email to inquire. Please note our new email address: tessarnold@gmail.com . You will need the free Adobe Acrobat reader available here. Having problems? Email us and we will send you an order form. This season we are offering Italians and Russians. Italian: Bred from resistant survivor stock. No chemicals used for ten years. Relatively gentle and calm. Strong disposition to brood rearing which provides a large population for nectar collection and continues even during nectar slowdowns, resulting in high stored food consumption during the inactive winter months. Overwinters well, builds up quickly in spring. Sometimes exhibits robbing behavior. Russian: From artificially inseminated breeder queens. Resistant to varroa mites. No chemicals used. Exceptionally winter hardy, good honey producers. A little more aggressive than Italians. 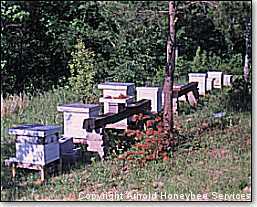 Three-frame nuc with bees and queen; hive body with six frames, foundation and frame feeder; super with nine frames and foundation; top and bottom board.